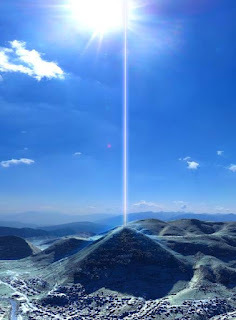 Bosnian Pyramid of the Sun Energy Beam ! The Bosnian Pyramid, Visocica Hill, is the first European pyramid to be discovered and is located in the heart of Bosnia, in the town of Visoko. The pyramid has all the elements: four perfectly shaped slopes pointing toward the cardinal points, a flat top and an entrance complex. On top of the pyramid are also the ruins of a Medieval walled town, once the base of a Bosnian king Tvrtko of Kotromanic (1338-1391). Because of its similarities to the Pyramid of the Sun in Teotihuacan, Mexico, it has been named the "Bosnian Pyramid of the Sun" ('Bosanska Piramida Sunca'). There are also four more ancient structures on the site, the Bosnian Pyramid of the Moon ('Bosanska Piramida Mjeseca'), Bosnian Pyramid of the Dragon ( 'Bosanska Piramida Zmaja'), Bosnian Pyramid of Love ('Bosanska Piramida Ljubavi') and Temple of the Earth, ('Hram Zemlje'). 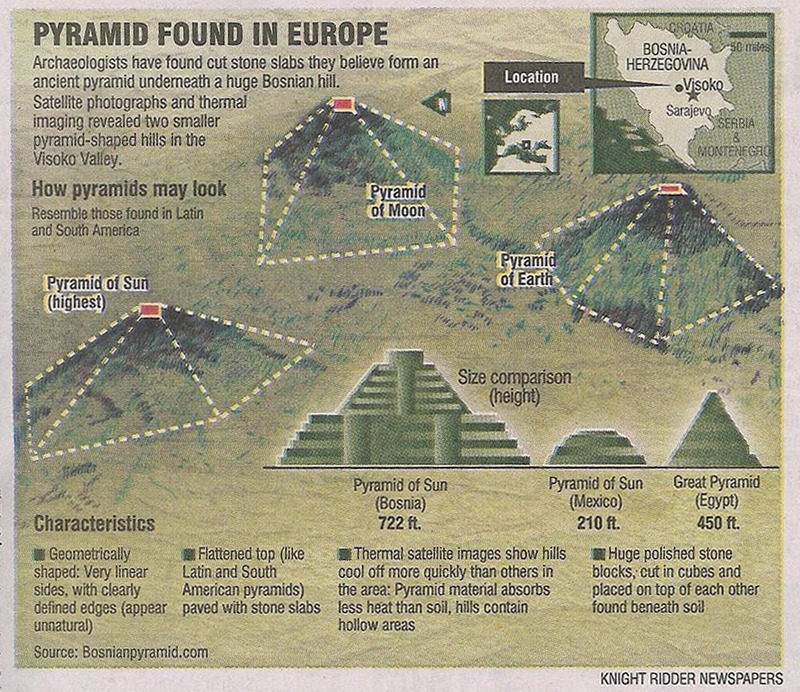 'We have already dug out stone blocks which I believe are covering the pyramid', said Semir (Sam) Osmanagic, a Bosnian American archaeologist who has spent the last 15 years studying the pyramids of Latin America. 'We found a paved entrance plateau and discovered underground tunnels'. The Bosnian Pyramid of the Sun with its height of over 220 meters is much higher than the Great Pyramid of Egypt (147 meters). The Bosnian Pyramid of the Sun has, according to the Bosnian Institute for Geodesy, the most precise orientation towards cosmic north with the error of 0 degrees, 0 minutes and 12 seconds. The Bosnian Pyramid of the Sun is completely covered by rectangular concrete blocks. The properties of the concrete, including extreme hardness (up to 133 MPs) and low water absorption (around 1%), are, according to the scientific institutions in Bosnia, Italy and France, far superior to modern concrete materials. The pyramids are covered by soil which is, according to the State Institute for Agro-pedology, approx. 12,000 years old. Radiocarbon dating from the paved terrace on the Bosnian Pyramid of the Moon, performed by Institute of Physics of Silesian Institute of Technology from Gliwice (Poland) confirmed that terrace was built 10.350 years ago (+/- 50 years). These findings confirm that the Bosnian pyramids are also the oldest known pyramids on the planet. Beneath the Bosnian Valley of the Pyramids there is an extensive underground tunnel and chamber network which runs for more than ten miles. Ceramic sculptures have been discovered in the underground labyrinth with a mass of up to 20,000 pounds which makes them the largest found so far from the ancient world. The list of wonders in Bosnian archaeology does not end here. In the vicinity, we discovered the tallest tumulus in the World: 61 meter high. Its nearest competitor, Sillbury Hill in England is 60 meters high. The Bosnian tumulus consists of two-layer megalithic terraces, clay layers and artificial concrete layers. A team of physicists detected an energy beam coming through the top of the Bosnian Pyramid of the Sun. The radius of the beam is 4.5 meters with a frequency of 28 kHz. The beam is continuous and its strength grows as it moves up and away from the pyramid. This phenomenon contradicts the known laws of physics and technology. This is the first proof of non-hertzian technology on the Planet. It seems that the pyramid-builders created a perpetual motion machine a long time ago and this “energy machine” is still working. In the underground labyrinth, in 2010, we discovered three chambers and a small blue lake. Energy screening shows that the ionization level is 43 times higher than the average concentration outside which makes the underground chambers into “healing rooms”. Almost everything they teach us about the ancient history is wrong: origin of men, civilizations and pyramids. Homo sapiens sapiens is not a result of the evolution and biologists will never find a “missing link”, because the intelligent man is product of genetic engineering. Sumerians are not the beginning of the civilized men, but rather beginning of another cycle of humanity. And finally, original pyramids, most superior and oldest, were made by advanced builders who knew energy, astronomy and construction better than we do.